Jetpack offers more than 30 modules as part of a single plugin and you can activate or deactivate the needed ones for your site. Publicize is one of the modules used to setup automatic sharing of your WordPress blog posts to social media sites. In this article we will explain the process of setting up auto sharing and also provide some useful tips when using Publicize. 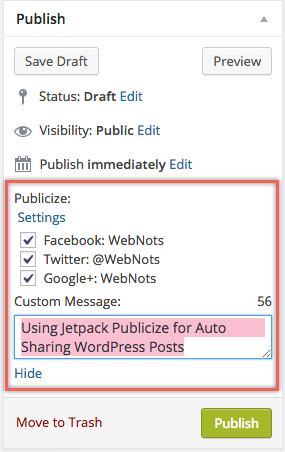 First install Jetpack plugin and activate the Publicize module. You can click on the “Configure” link from Jetpack or navigate to “Settings > Sharing” menu on your WordPress admin dashboard. You will be shown with the social medial options of Facebook, Twitter, LinkedIn, Tumblr, Path and Google+ for connecting. Connect with your social accounts by clicking on “Connect” button. You can also add more than one accounts (say two Facebook accounts) and choose whether you want to share on your profile or page’s timeline. That’s it!!! Now onwards whenever a new post is published, it will be automatically shared with the connected social accounts. Once the module is activated, you can see an option under “Publish” section of your WordPress editor when creating a post. You will be shown with the list of connected accounts and “Edit”, “Details” and “Settings” link. The post title by default will be used as a title of the shared article. Click on the “Edit” or “Details” link to modify the title by with custom message. Also you can choose particular social accounts for sharing. For example, you can choose one Facebook account when multiple accounts are connected or disable Twitter account so that the article will not be shared on Twitter. Generally Publicize uses the ugly URL of the post ending something like “…/?p=1” which may not look good when someone is looking at the shared article on Facebook or Twitter. You can enable Publicize to use WordPress permalink (that is blog post name as URL) by adding the below code in your theme’s “functions.php” file. Generally the featured image of the post will be used for sharing. Post will be shared only one time when it is newly published. Saving as draft or updating the post will not share it again. Scheduled posts will be shared when they are published online. Pages and other custom post types will not be shared when using Publicize. But standard templates like Woocommerce products will be shared by default. A user with “Contributor” role can’t use Publicize. When connecting with social account you have an option to make the connection available only for you or all blog users. If you decided to make the connection available for all users then they can only share the articles and will not be able to view your social accounts under “Settings > Sharing” section.